The renin-angiotensin system (RAS) of the brain produces a series of biologically active angiotensinogen-derived peptides involved in physiological homeostasis and pathophysiology of disease. Despite significant research efforts to date, a comprehensive understanding of brain RAS physiology is lacking. 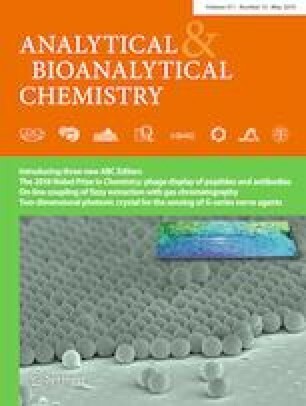 A significant challenge has been the limited set of bioanalytical assays capable of detecting angiotensin (Ang) peptides at physiologically low concentrations (2–15 fmol/g of wet tissue) and sufficient chemical specificity for unambiguous molecular identifications. Additionally, a complex brain anatomy calls for microanalysis of specific tissue regions, thus further taxing sensitivity requirements for identification and quantification in studies of the RAS. To fill this technology gap, we here developed a microanalytical assay by coupling a laboratory-built capillary electrophoresis (CE) nano-electrospray ionization (nano-ESI) platform to a high-resolution mass spectrometer (HRMS). Using parallel reaction monitoring, we demonstrated that this technology achieved confident identification and quantification of the Ang peptides at approx. 5 amol to 300 zmol sensitivity. This microanalytical assay revealed differential Ang peptide profiles between tissues that were micro-sampled from the subfornical organ and the paraventricular nucleus of the hypothalamus, important brain regions involved in thirst and water homeostasis and neuroendocrine regulation to stress. Microanalytical CE-nano-ESI-HRMS extends the analytical toolbox of neuroscience to help better understand the RAS. Peter Nemes, Camille Lombard-Banek, and Paul J. Marvar designed the research and interpreted the data. Zhe Yu and Adam P. Swiercz performed the water deprivation treatment and collected the tissues. Camille Lombard-Banek measured the samples. Camille Lombard-Banek and Peter Nemes analyzed the data and interpreted the results. Camille Lombard-Banek, Peter Nemes, and Paul J. Marvar wrote the manuscript. All the coauthors commented on the manuscript. The reported work was partially supported by the Arnold and Mabel Beckman Foundation Beckman Young Investigator Grant (to P.N.) and the National Institutes of Health grants 1R35GM124755 (to P.N.) and R01HL137103 (to P.J.M.). All protocols regarding the humane treatment of animals were approved by the Institutional Animal Care and Use Committee of The George Washington University (IACUC no. A279). Wright JW, Harding JW. Importance of the brain angiotensin system in Parkinson’s disease. Parkinsons Dis. 2012:860923. https://doi.org/10.1155/2012/860923. Onjiko RM, Morris SE, Moody SA, Nemes P. Single-cell mass spectrometry with multi-solvent extraction identifies metabolic differences between left and right blastomeres in the 8-cell frog (Xenopus) embryo. Analyst. 2016;141(12):3648–56. https://doi.org/10.1039/c6an00200e. Onjiko RM, Portero EP, Moody SA, Nemes P. Microprobe capillary electrophoresis mass spectrometry for single-cell metabolomics in live frog (Xenopus laevis) embryos. J Vis Exp. 2017;(130):e56956. https://doi.org/10.3791/56956. Lombard-Banek C, Portero EP, Onjiko RM, Nemes P. New-generation mass spectrometry expands the toolbox of cell and developmental biology. Genesis. 2017;55(1–2). https://doi.org/10.1002/dvg.23012.